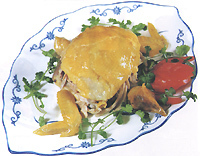 Hainan Cuisine consists of the following three parts: 1. Banquet dishes, which are prepared with complicated cooking techniques, and a wide variety of materials. 2. Simple and quick dishes, which are mainly served by small restaurants and food stands, featuring convenient and quick service and cheap prices. 3. Home-style dishes, which are cooked with local seasonal vegetables, such as Fried Dried Bean Curd, Fried Sliced Meat and Bean Curd, Steamed Fish with Shredded Ginger, Sweet and Sour Fish, and Soy Sauce Pork. Influenced by the weather, geographical environment, local products and resources, and eating and drinking customs of Hainan Island, Hainan Cuisine includes various kinds of dishes. Some are delicious, prepared with famous and special seafood, some are salty and delicious, such as fried dishes and thick soup, and the others have sweet and sour, spiced, soy sauce and bamboo tastes.